’Tis the season to make candy! With the holidays, we have every reason to indulge and make sugary, buttery, chocolaty sweets for the family or as gifts. And homemade Christmas candies can create lasting memories, as we found out when we began the process of testing and tasting. It seemed that everyone had a story to tell of their sweet family traditions. If you don’t have such a tradition, why not adopt one of our Christmas candy recipes and start your own? We’ve chosen 4 candies that are timeless and no-fuss, some of them not even involving a saucepan or the stove. With these delectable recipes, we’re guessing you won’t have any trouble enlisting the whole family to help with the stirring and rolling and dipping…and, yes, tasting! 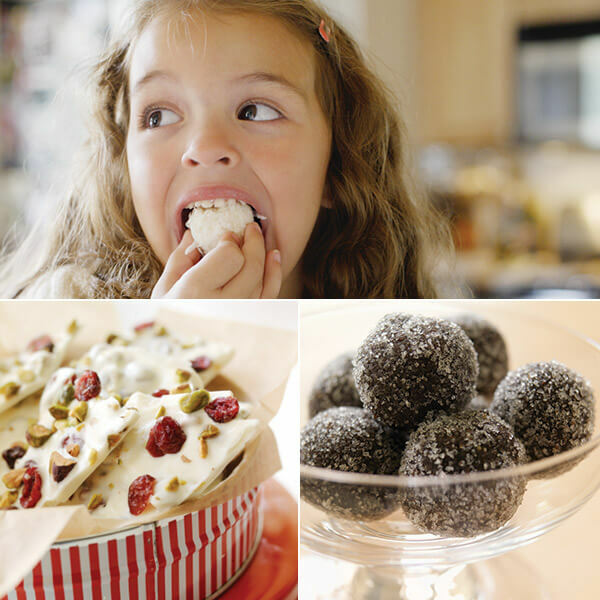 This is a great one for kids, who tend to be big fans of white chocolate. However, if you are making these for kids, you’ll want to omit the alcohol and add two more tablespoons of cream or milk to the mixture. The principle for making a bark is very simple: You melt baking chips, stir in a crunchy ingredient and a sweet, fruity one, let the mixture harden, and break it into pieces. These are usually made with crushed vanilla cookies, but we used chocolate wafers for a deeper chocolate flavor.